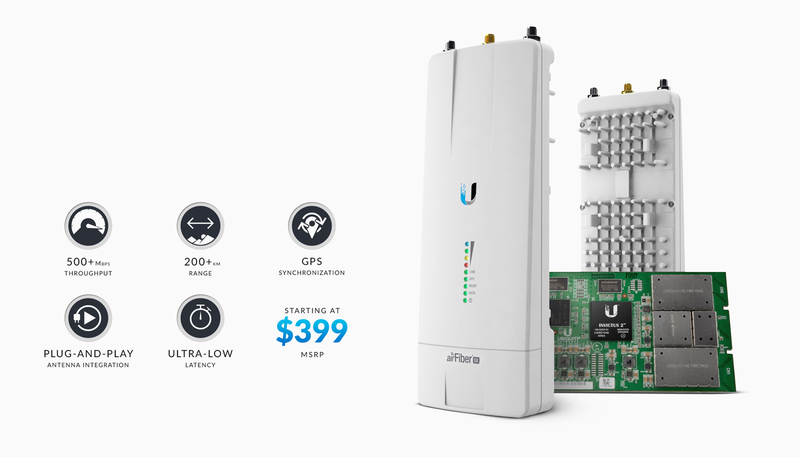 The airFiber AF-4X-US 4 GHz Carrier Backhaul Radio from Ubiquiti Networks is designed for long-range, Point-to-Point (PtP) backhaul links. It features a high TDD throughput and Hybrid Division Duplexing (HDD) technology that helps the device achieve low latency. The airFiber 4X also allows users to customize backhaul links or upgrade existing PtP links. The airFiber AF-4X operates using the 4 GHz frequency band and features a range of 656,168' / 200,000m. Included with this device is a GPS antenna mount, an external GPS antenna, a metal strap, two cable ties, a 24V/1A airFiber PoE adapter with a mounting bracket, and a power cord. Box Dimensions (LxWxH) 10.4 x 4.4 x 4.3"